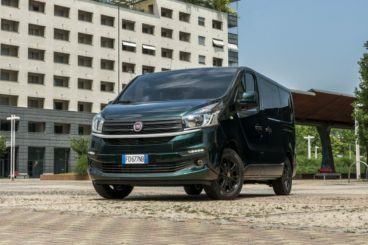 The new Fiat Talento Combi Diesel Estate might sound new, but it’s essentially a rebadged variant of the Vauxhall Vivaro and the Renault Trafic, two vans we’ll be comparing it to a little later. This is good news in one sense, as it means that the Talento can cream all the hard work that those two brands have already put in. There are a lot of similarities between the three vans. Even as you look at them, the only things that really separate them are the grille treatment and the badging. So which one should be your new best pal on the road? OSV takes a closer look at what it’s all about with our 2018 Fiat Talento Combi Diesel Estate review. Fiat is almost 120 years old. Read more about their history here. The Talento Combi’s 1.6-litre MultiJet engine develops a decent 118bhp, as well as 300Nm of torque. It offers surprisingly good refinement and punchy performance, and while Fiat hasn’t quoted performance figures, it’s a genuine treat to drive. There’s lots of mid-range shove and it copes well with the van on a full load. This is in comparison to Renault’s new twin-turbo engines which are performative and efficient. 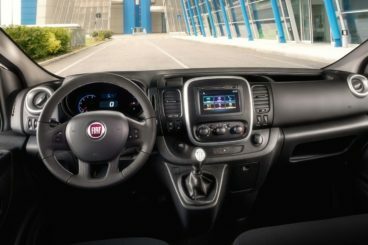 The Fiat stands up well, and its engine comes paired up with a manual transmission that changes gear quickly and seamlessly, while the well-weighted steering ensures that it’s easy to place the Talento accurately. This is a bonus because vans of this type are usually let down by overly light steering. Not so here. The brakes are strong too, and there isn’t much body lean to speak of. A comfortable ride is another major tick in the “plus” box, while a fixed bulkhead keeps exterior noise to a minimum. The driving position is well worth a mention. As you climb aboard, you’ll find that the raised seat is already well positioned, but the fact that both the seat and the steering column offer plenty of adjustment is yet another bonus. The raised seat means visibility is fantastic too, with a wide-angle section at the lower end, and big wing mirrors reducing the number of blind spots you might have otherwise experienced. The Talento isn’t as upmarket as some rival vans – especially the PSA group vans – but there’s nothing between them when it comes to practicality. Style-wise, the Fiat doesn’t look or feel premium. Its cab gets treated to a two-tone plastic fascia, but it feels robust and tough more than stylish. It’s built to last at least and should stand the test of time. Overall fit and finish is decent but can’t compete with upmarket rivals, but the Fiat’s cabin is still a genuinely nice place to spend your time on the road. Entry-level models miss out on a seven-inch touchscreen that comes with sat-nav, and it’s a very neat feature for top-spec models. It comes with smartphone integration too, but ultimately the Talento misses out on the likes of speed limit assistance or head-up display, two features that modern vans produced by Citroen and Peugeot get. Is the Fiat Talento Combi Diesel Estate practical? This is its strength, with Fiat claiming that there are 90-litres worth of storage dotted around the cabin. If you want extra usability, you can order an office facility that allows you to order a table that converts into a fold-down passenger seat – or vice versa. There’s a low-roof short wheelbase variant available, as well as a long wheelbase variant with a high-roof that can offer 8.6 cubic metres of space. The smaller wheelbase model is spacious too, with a cubic capacity of 5.2 cubic metres, while the max payload is 1,249kg. The long wheelbase variant has a load length of 4,150mm, but you need to specify the CargoPlus feature to get that amount of spar. Access is easy thanks to the large doors, while the back doors open at a 255-degree angle. That said, a large sliding door has a 1,030mm opening, which means it can’t swallow a Euro pallet. Standard kit is decent, with the entry-level model getting a digital radio, Bluetooth, a height adjustable driver’s seat, electric windows and mirrors and central locking. The SX Combi adds 17” alloys, sat-nav, cruise control, automatic lights and wipers and fog lights. The Fiat Talento hasn’t been crash tested by Euro NCAP, but one of the cars on which it’s based – the Renault Trafic – was awarded 3/5 for its own crash test performance. This is in contrast to the likes of the Peugeot Expert and the Citroen Dispatch, both of which were awarded 5/5. The Trafic scored poorly for adult occupant protection, while standard safety kit for the Talento includes Traction+, emergency brake assistance, ABS with EBD and LED daytime running lights. Is Fiat reliable? Read our unbiased and informative summary here. Prices for the new car start out from £21,050 and rise to £31,920. For more information on our leasing deals, you can check out our page here. In terms of its running costs, the 1.6-litre MultiJet diesel is nice and frugal. A 94bhp variant will be too underpowered for most buyers, but it returns a respectable 43.5mpg while emitting around 169g/km of CO2. Adding stop-start will cost you a bit more cash, but you can get those economy figures up to 46.3mpg. The 118bhp variant – which is our top pick – is good for returns of 43.5mpg, which is the same as the smaller engine. Overall, these figures are decent but the problem for Fiat is that there are a number of rivals that are significantly cheaper to run. It’s one of the easiest and – dare we say it – pleasant vans to drive, ever. It has an assertive, confident air about it and it looks good on the road. If you’ll be spending all day in your van, this one has you covered with comfortable seats and a good ride. It hasn’t been crash tested by Euro NCAP, but the van on which it’s based has a three-star safety rating. Moreover, this one lacks advanced safety options. In isolation, the Talento looks efficient and frugal – but rivals are even more so. Let’s see how the van fares against its rivals in the comparison section of our 2018 Fiat Talento Combi Diesel Estate review. The new Renault Trafic is economical, comfortable and neatly designed. It stands out in the panel van sector. We prefer the 113bhp variant. It’s more rounded and can get you from a standstill to 62mph in 12.4 seconds. It’s refined, smooth and can boast 300Nm of torque. Next up is a 118bhp variant, which takes 12.0 seconds to complete the 0-62 dash. Why upgrade from 113bhp to 118bhp? There’s an improvement in economy, which will appeal to buyers. Rounding off the range is a 140bhp variant that has 340Nm of torque and a 0-62 time of 10.8 seconds. It makes good progress but it doesn’t feel as effortless as some rivals. In terms of the way it drives, the Trafic is comfortable, rides well and can offer nicely weighted steering. Running costs? The 118bhp can return almost 48mpg while emitting 155g/km of CO2. It’s the only engine in the range that comes with stop-start tech and is the cheapest to run in the range – despite offering more pace and power than two other engines. Inside, the Trafic benefits from a slew of passenger van touches that give its cabin a really inviting feel. Solid and tough plastics are behind the two-tone dash, the instrument cluster is funky, and we think buyers will appreciate the piano black surrounds for the air vents. 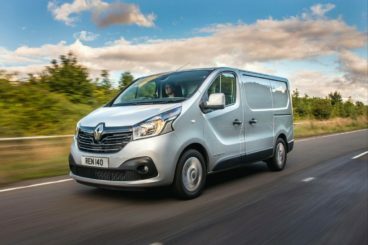 Is the Renault Trafic practical? It largely has the same boxy dimensions as last time, but the van is now longer – it’s just 1mm off 5,000mm. The load bay takes up about 50% of the extra length, which means that even the short wheelbase model is spacious enough to swallow eleven standard sheets of plasterboard. Buyers can choose from two roof heights, two wheelbases, a platform cab, a 9-seater minibus or a 6-seater crew van. 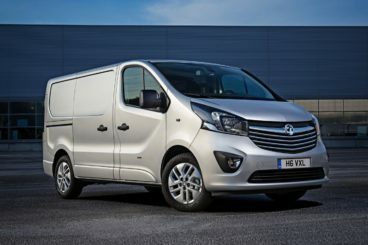 The new Vauxhall Vivaro is British-built, refined, comfortable and very practical. Like the Renault, the Vauxhall is powered by 1.6-litre engines that sound small, but which are more than competent. An 89bhp variant sits at the bottom of the range, and while it’s no all-rounder, it’s perfectly at home in the towns and cities. A 113bhp variant is better suited to the open road, but it’s the 118bhp engine that’s the best all-rounder. It’s a strong twin-turbo engine that’s smooth, performative and refined. If your budget stretches far enough and you need more power, the range-topping 138bhp variant is worth a look. It’s a twin turbo engine that produces 340Nm of torque and copes well with the Vivaro on a full load. In terms of how it drives, the Vivaro is super smooth, its predictable steering gives you confidence, and its brakes are nice and strong. Running costs? Without stop-start tech, the entry-level 89bhp variant can return 43.5mpg. Add stop-start tech and it can return as much as 46.3mph while emitting 160g/km of CO2. The 113bhp offers the same returns, while even the 138bhp variant can return 46.3mpg on a good day. Inside, the Vivaro is well insulated, solidly built and even boasts a few sweet design touches that make it a really pleasant place to be. The instrument cluster is lifted from the Renault Clio, and the air vents are surrounded by the same piano black as the Renault. The air conditioning controls are a bit cheap-looking, while the digital radio looks like an example of cost-cutting. On the whole, though, the cabin gets our thumbs up. Is the Vauxhall Vivaro practical? The van has increased in length by 116mm, which means both the driver and their front passengers get more legroom. If you need more seats, you can opt for the 6-seater crew van. Otherwise, it’s just the driver and two front passengers. The short wheelbase model offers 2,538mm of load length, but if you specify the load through bulkhead, you can extend that. A high roof model is available, and this offers 1,898mm of load height. Whichever model you go for, there are twenty load lashing eyes on the walls and floor, and the load area is well executed and easy to access via split rear doors. The Talento is a new name but this is essentially a repackaged version of the Renault Trafic. That’s not a bad thing at all, and the result is a stylish, good to drive and very usable van that has lots of appeal. It’s comfortable too, which will suit anyone who’s planning to spend large chunks of their day in their van. There are concerns over safety and economy, but it’s all a matter of priorities. The Fiat Talento Combi Diesel Estate looks good, feels good, and is super useful.